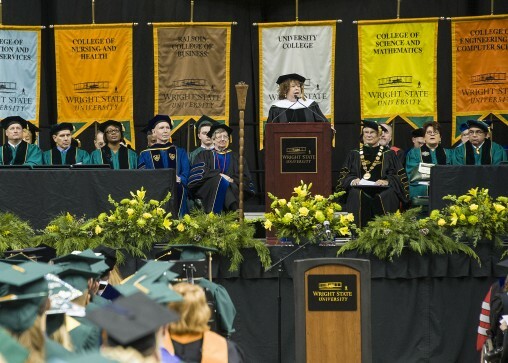 Hundreds of graduating Wright State University students were praised as a special group who believe in standing up for others and urged to put their energies into healing a troubled world and working for peace. The graduates were addressed by university President David R. Hopkins and Sharon Honaker Rab, founder and co-chair of the Dayton Literary Peace Prize, during fall commencement at the Wright State Nutter Center on Saturday, Dec. 19. “I’ve watched you become not passive bystanders but active bystanders in confronting hatred and prejudice and injustice wherever you found it,” he said. Hopkins said he has watched the students transform the campus with their spirit and unselfish commitment to serve others. Hopkins said it is not someone else’s problem to preserve the environment or save a species from extinction or put an end to hunger, homelessness, discrimination and injustice. Rab, who was awarded an honorary Doctorate of Humane Letters at the ceremony, said the Dayton area has a long history of inventions and inventive problem-solving and detailed her perseverance in creating the Dayton Literary Peace Prize, one of the most prestigious awards in the world. She urged the graduates to turn a deaf ear to doubters and surround themselves with people who support new ideas and who will help them turn those ideas into reality. Rab said that when she watches the news and “the world goes dark with terror and angry rhetoric and hatred,” she goes to her office and works on the peace prize. The Dayton Literary Peace Prize grew out of the 1995 Dayton Peace Accords, which ended the Bosnian War. The prize was established in 2006 as the first and only annual U.S. literary award given in recognition of writers who promote peace through works that lead readers to a better understanding of other cultures, peoples, religions and political points of view. Rab graduated from Wright State with a Master in Education degree in 1975. She taught language arts for 30 years at Kettering Fairmont High School and served as an adjunct instructor of composition at Miami University for 14 years. She was twice a finalist for Ohio Teacher of the Year. For 20 years Rab produced and hosted “Writer 2 Writer,” a cable television show on which she interviewed hundreds of local, national and international authors. A writer herself, Rab’s yet-to-be-published novel “Paper, Scissors, Rock” was a finalist for the Pen Bellwether Award for Socially Engaged Fiction. More than 1,200 Wright State students graduated at the commencement ceremony. They received 742 bachelor’s degrees, 447 master’s degrees, 25 doctoral degrees, three post-master’s degrees and 12 associate degrees. The commencement class included graduates from 46 Ohio counties, including 731 graduates from the 16 counties anchored by Wright State’s Dayton and Lake campuses and 151 from other Ohio counties. Graduates also hailed from 20 different states and Washington, D.C. And the class included 282 international students from 25 nations, with India boasting the largest number of global graduates with 185. Graduating students ranged in age from 19 to 64, with the average age being 26.